Passengers are welcome to board our ship at 6:00 p.m. After comfortably settling into your cabins, we'll introduce our crew at a welcome cocktail. Dinner tonight will be followed by a canal boat tour of the city. We'll spend this morning cruising. Join us for an excursion to the Keukenhof Gardens(1). Each spring, more than 7 million bulbs bloom in the garden, with a total of 800 varieties of tulips. We'll return on board in Rotterdam. Tonight's our gala dinner and evening. We'll spend the whole day cruising on the Hollands Diep, passing through the Volkerak and Kreekak locks. We'll cross the port of Antwerp, one of the largest in Europe. Upon arrival in Antwerp, we'll set out with our hostess to explore the old town. Enjoy one last buffet breakfast on board before disembarking. Possibility of a transfer(2) by coach from Antwerp to Amsterdam for an extra fee. End of our services. 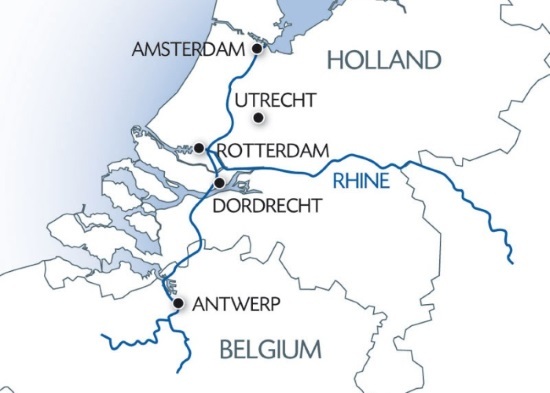 From Amsterdam to Antwerp via Rotterdam, embark on a journey between cities and picturesque landscapes, major European ports and historic canals. Be seduced by a four-day cruise full of culture and tradition. (1) Open from March 26th to May 17th, 2020. (2) Transfer guaranteed for a minimum of 15 travelers. If this number is not reached, the transfer may be proposed at another rate, depending on the number of participants. Please drink in moderation. Please ask your Vacations To Go travel counselor for more informatio n.